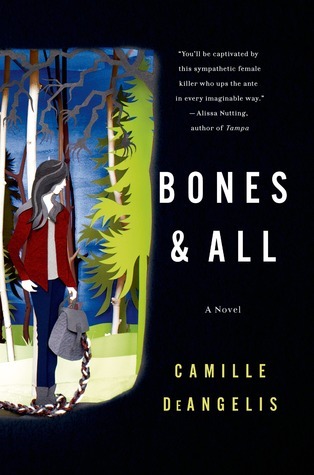 This is a Review: Bones & All, by Camille DeAngelis, Or: Why Didn't I Just Skip the Acknowledgements? Sixteen-year-old Maren Yearly has a problem. Ever since she was a baby, she's done this thing whenever anyone tries to get too close to her. She, well, eats them. As the title says, she devours them, skeleton and all, and tosses out their clothes and other inedibles when she's finished (interestingly, the book never specifies the human parts that can't be eaten—I'm still so curious!). With a little bit of back-story to get us going, this novel really begins with Maren waking up one day to find that her mother has abandoned her, leaving her a small wad of cash and her birth certificate. Having never known his name before, Maren immediately decides to go find her absent father, hoping he can help her unravel her horrifying secret. She gets some help along the way, and we get to hear the stories of a couple other "eaters," likewise trying to get by in a world that can't accommodate their urges. The story moves along briskly, perhaps a bit too much so at the end. Though I was surprised and impressed by some of the climactic events, the ending on the whole felt like more of a whimper. While the prose itself is nothing to write home about, DeAngelis manages to bring some very intriguing and real quandaries to the forefront, most revolving around the theme of human loneliness. What is life like for mothers who can't bond with their children? How do we become intimate with one another, without one (or both) parties utterly consuming the other? Can we overcome the more "monstrous" aspects of ourselves, or do we ultimately have to accept our core natures? It also struck me that many of the people Maren ended up eating (WARNING: the next part of this sentence could be considered a spoiler) are teenagers and men who come on to her sexually. And there were a lot of them. I felt uncomfortable reading at times, but perhaps this is exactly what DeAngelis wanted me to feel. However, I can't decide if this dynamic (or any of the more interesting literary devices, really) were intentional. At the very end of the book, DeAngelis makes it very clear in her acknowledgements that she is a vegan and that "the world would be a far safer place if we, as individuals and as a society, took a hard, honest look at our practice of flesh eating along with its environmental and spiritual consequences." (Loc 3675) Note: I'm quoting this from the ARC and cannot claim that it will remain the same in final print. This kind of wrecked the book for me, I'm sorry to say. It isn't that I don't agree that we should be mindful of our eating habits, especially as they pertain to other living creatures, but... it really didn't seem like the thrust of her novel, and this bit of soapboxing struck me as out of place and more than a bit preachy. All in all, this was a quick, engaging read that would be perfect for anyone with an interest in YA and horror/supernatural elements. While it has plentiful food for thought about the careful balance of intimacy and emotional distance, the story suffered from some choppiness in the plot and what felt like a misplaced agenda. I really wish I'd just glossed over the acknowledgements. Requisite disclaimer: I received an ARC of Bones & All by Camille DeAngelis from NetGalley in exchange for an honest review. Thanks to St. Martin's Press for giving me the chance to read it! Meant to comment on this ages ago, SORRY. Yeah, hearing that that's her agenda makes me not want to read this. Like I have nothing against veganism and we should question eating meat or whatever, but it seems like it simplifies the potential messages of this novel. OH well. No worries, ladycakes. And yeah! I just couldn't help but feel like all the cool metaphors/messages weren't actually what she was going for, and what she actually meant was something a lot less interesting. It's a bummer, because the story itself was decent.